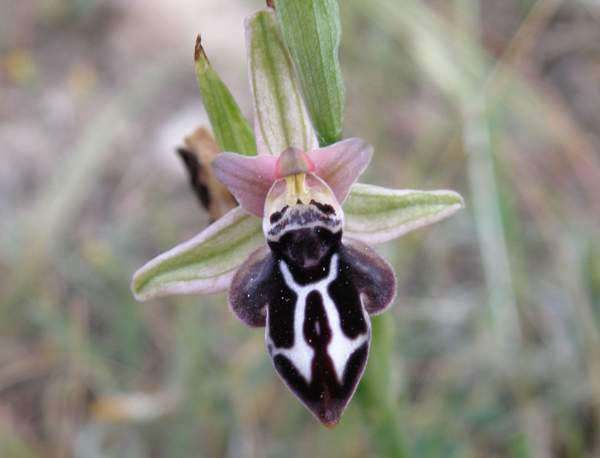 Both Ophrys cretica and the very similar looking Ophrys ariadne occur on Crete and some of the other islands close by causing confusion with accurate identification. 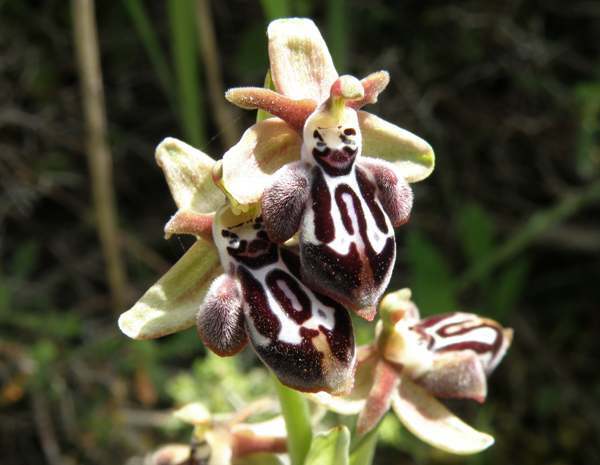 The pattern on the lip, which is more complex on Ophrys ariadne, is the main distinguishing feature. This is a very distinctive looking orchid which grows to 40cm.The inflorescence carries up to 10 vivid flowers distinguished by the speculum which is broadly outlined with white against a dark, velvety-looking lip. The petals and sepals are a drab green colour tinged with brownish red. Locally abundant in the Southern Aegean islands. Ophrys cretica grows in sunny or partially shaded habitats and is found on abandoned farmland, poor grassland and in scrub. This orchid flowers from mid-March to the end of April..